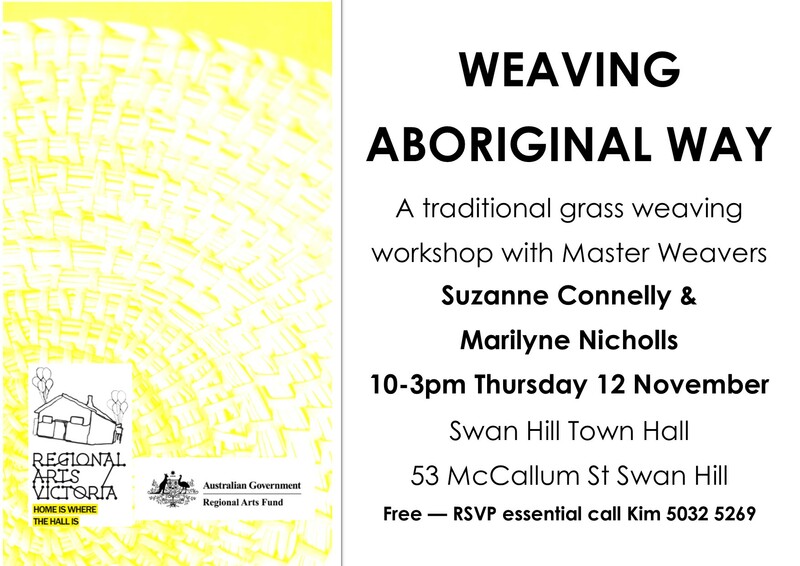 Master weavers Marilynne Nicholls and Suzanne Connelly will run a workshop for women to learn traditional grass weaving. The Swan Hill Town Hall is located in the centre of town. It was opened in 1935. The design of the hall was by modernist architect AC Leith, who also designed the halls at Morwell, Casterton and Heidelberg at around this time. It was noted in the local paper as a ‘dignified’ building, and was opened with a grand ball with a twelve piece orchestra, and culminated in a ‘ham and turkey supper’. In recent years the Town Hall has been the venue for weddings, balls, community celebrations, youth theatre festivals, travelling theatre performances and concerts.